I am a sucker for foundations and I love trying different foundations. We don't get all brands in India and I want to try everything make-up on this earth. Hence, online make-up shopping, which, often results in getting wrong shades of foundations and this becomes a major issue when the product is newly launched and there aren't many reviews online to shade match. This happened recently with me when I ordered Armani's newly launched Power Fabric Longwear High Cover Foundation. I generally look for foundations that have medium to full coverage because of my problematic skin which often freaks out. Power fabric's description had everything I wanted in my foundation - longwearing + full coverage + velvet finish + relatively higher SPF of 25 = my ideal everyday foundation. I use shade 7.5 in Luminous Silk and its tad bit darker for me but nothing that could make me look oompa loompa. So, I placed the order for Power Fabric foundation in shade 7.5 from Selfridges. I was super confident about the shade as the description in Sephora's website said "Tan Skin with Golden undertone". Unfortunately the shade was not right for me. Shade 7.5 in Power Fabric is way too neutral as compared to Armani LS's 7.5 (which you could see in the photo below) and nowhere close to 'golden tan' as described on Sephora. Regardless, I tried it on its own and immediately fell in love with the finish. 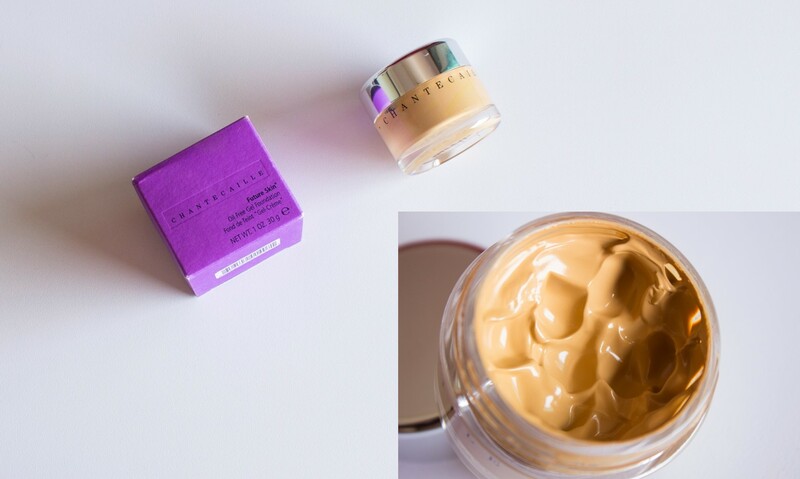 It made my skin smoother, the coverage was medium but buildable to full. But, it did look make-upy and I could see the foundation sitting on my skin and the shade looked very grey on me which made me look ghostly. I immediately wiped it off and regretted buying it. Let's roll back few months in the past. This shade mismatch incident happened with me few months ago also when I got myself Chantecaille Future Skin foundation in shade 'Sand'. But, this was not as horrific as the Power Fabric shade horror as the undertone was right. 'Sand' shade was too deeper for my complexion but I was still using it and the shade would look ok if not perfect after concealing and all that jazz. A beautiful foundation, by the way. So, I tried mixing a pump of Power Fabric 7.5 with a pea sized amount (almost equal part) with the Future Skin foundation in shade Sand and voila - it was my exact shade match - even better match than Armani LS 7.5. I have been wearing this combo straight for about 2+ weeks now and it has quickly become my 'go to' favourite base for everyday. I like the combination of two foundations better than Power Fabric alone. I don't know what the Future Skin foundation, which is gel based and 60% water, does to Power Fabric foundation. 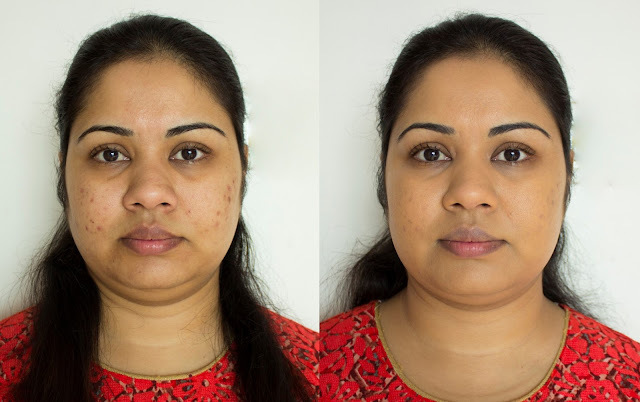 It looks like skin but better which is even toned (dark spots still require concealing, which is ok for me), smoother and healthier. I do get oily through the day and requires blotting at least once. Here's my puffy morning face with just Bobbi Brown Vitamin Enriched Face Base (skipped the smoothing primer for this post) of left and and just the foundation mix of Power Fabric and Future Skin on my face on the right. If you could it perfectly matches my complexion and beautifully evens out my skin, especially the darkness around my chin. This is how the foundation mix finally looks on me after I spot conceal the dark spots, conceal my under eye dark circles (setting the base in place with LM Translucent Powder) and add the dimensions back with some bronzer, blusher and highlight. I hope this post inspires some of you to mix and match your foundations because I am sure we all go through this foundation shade mismatch horror. I have been theough this several times. My skin is warm, but pale, and mist foundations are either too dark or too pink based. For me, the The Body Shop Lightenin Drops have been amazing, they help adjust the shade ever so slightly, making it a dloser match to my skintone. So far I have never tried mixing two foundations, but I may in the future, should the drops not be enough. TBS drops are a great option too. Does it alter the finish of foundation?